Update: Additional comments from medical team on significance of lack of botulism found in tests, included in text. Doctors attending to the care of Otto Warmbier told media at a press conference on Thursday that they are unable to ascertain with certainty what caused the severe neurological injury he suffered in North Korea. Doctors Daniel Kanter, Jordan Bonomo and Brandon Foreman of the University of Cincinnati Health Center however said that tests showed “extensive loss of brain tissue in all regions of the brain”. They also said that no signs of botulism were found, saying in a statement issued to NK News that in severe cases of the illness the doctors would expect to have found indications of the illness manifested in abnormalities in the nerves and muscles. “We have no certain or verifiable knowledge of the cause or circumstances of his neurological injury,” Dr. Kanter said in an opening statement. “This pattern of brain injury however, is usually seen as a result of cardiopulmonary arrest where the blood supply to the brain is inadequate for a period of time resulting in the death of brain tissue,” he added. He also described Warmbier’s condition as a state of “unresponsive wakefullness” meaning that there is random movement and eye opening, however he is not responsive to his surroundings or conscious of them. In follow up questions Dr. Bonomo reiterated that they are unable to verify what occurred to Warmbier but that in general, causes of a cardiopulmonary arrest in young and healthy individuals is often caused by respiratory arrest – which means the patient stops breathing for a long period of time. He added that there were a range of causes of respiratory arrest but the most typical causes for young healthy individual are usually intoxication or trauma. North Korea has claimed that Warmbier contracted a rare illness called botulism, had taken a sleeping pill and then subsequently fell into a coma. Earlier in the day Fred Warmbier, Otto’s Father, spoke at a press conference and dismissed the information provided by the North Koreans. “Even if you believe their explanation of botulism and a sleeping pill causing a coma and we don’t, there is no excuse for any civilized nation to have kept his condition a secret and denied him top notch medical care for so long,” Mr. Warmbier said. Questions arose at the press conference as to whether or not evidence of botulism was found following tests. The team conducted “electromyography and nerve conduction studies. Those tests did not reveal any evidence of active or chronic denervation or repetitive stimulation that would suggest botulism at this time,” Dr. Foreman said. “That is correct,” was the response from Foreman. NK News further sought clarification on whether or not the tests conducted by the medical team 15 months after the alleged botulism caused coma, would show traces of the toxin in Warmbier’s system. “We would expect a severe case of botulism to produce electrical abnormalities in nerves and muscles for a prolonged period of time, likely years,” Dr. Kanter said in a response issued to NK News via the media team at the medical center. The lack of such abnormalities raises serious doubts about the North Korean account of Warmbier’s condition and its causes. 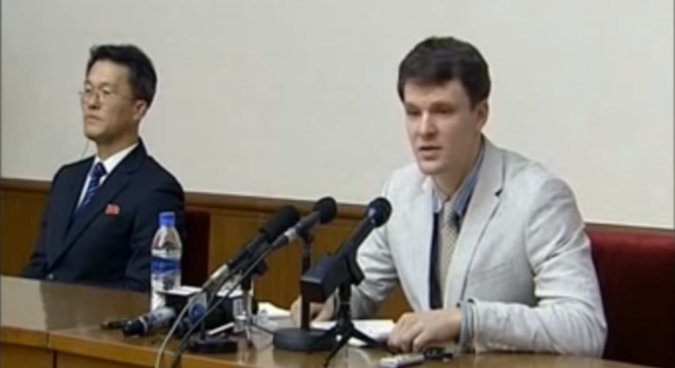 Dr. Kanter said that following a skeletal survey, they found no sign of healing bone fractures or skull fractures, which has been a source of concern amid speculation that Warmbier could have been subjected to beatings or physical trauma while in North Korean custody. Kanter also said that the care team had received two brain scans conducted in North Korea that were dated April and July 2016, with the April image showing sever tissue damage that likely had occurred weeks prior. He did state however that he was unable to verify if the scans were indeed taken at the times they were dated. The medical team would not comment on Warmbier’s prognosis or future prospects for recovery and the request of his family. Warmbier, a student of commerce and economics at the University of Virginia originally from Ohio, was arrested by authorities in early 2016 while on a visit to North Korea as a tourist, after he walked into a staff-only area of the Yanggakdo International Hotel in Pyongyang and took down a political slogan from a wall. He was subsequently sentenced to 15 years of hard labor for crimes against the state but was released on Tuesday on “humanitarian grounds”, according to North Korean state media on Thursday. Subscribe to read the remaining 777 words of this article.